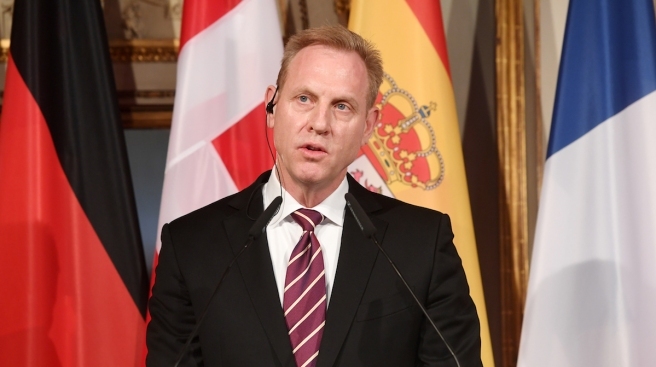 Patrick Shanahan, US Secretary of Defense, gives a press statement on the first day of the 55th Munich Security Conference at the meeting of defense ministers of the anti-IS coalition on 15 February 2019, Bavaria, Munich. Acting Secretary of Defense Patrick Shanahan clashed with Sen. Lindsey Graham over the administration’s Syria policy during a briefing last weekend, prompting Graham to unleash a string of expletives and declare himself Shanahan's "adversary," NBC News reported, citing two officials in the briefing and three others familiar with the conversation. The contentious briefing on the sidelines of the Munich Security Conference rankled the bipartisan group of lawmakers and cast doubt over Shanahan's chances of being confirmed if President Donald Trump nominates him to permanently lead the Pentagon, the officials said. The episode highlighted Shanahan’s increasingly strained relationship with Capitol Hill two months after his predecessor, Jim Mattis, stepped down.